I have never been able to get bread or pizza crust to come out as lovely, brown and chewy, crisp and crunchy, as when I use a baking stone. I never thought about using one before visiting one of those fantastic Chicago pizza places and tasting their creations baked on stone in a wood fire oven. While I can't yet afford the wood-burning, full-size version, I would be perfectly happy with this compromise. In the Cuisinart Brick Oven, the sides are lined with brick inserts, and there is a baking stone included. The baking stone can be removed if you prefer to cook with the rack instead. The additional heat penetrates to make your best dishes better and improve even the cheapest store-bought pizza in flavor and appearance. Bake, broil, brown, or toast just as you do in a regular toaster oven, but enjoy shorter cook times thanks to the convection process. The inside areas that aren't covered in brick are nonstick and wipe clean. People who have used it claim that this oven makes some of the best roasted meats they've ever had. 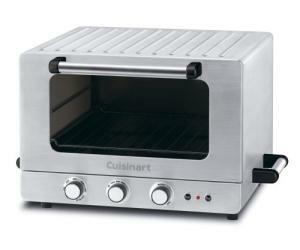 It is also small enough for the counter or to go in an RV, dorm room, or any place where a full oven is inconvenient, yet the functions of a full oven are still needed.